How was it for you? Friend, lover, stranger? Celebration, exploration or betrayal? Unmitigated disaster or the time of your life? Comedy or tragedy? Tea or wine? What colour were the curtains – or the sky? A climax? An anticlimax? Without these beginnings humanity could not continue. An Ancient Rite or just a Stab in the Dark? 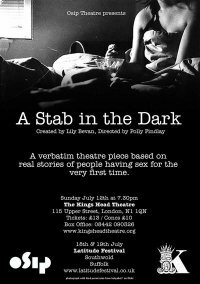 Osip Theatre presents true stories of losing virginity, including the experiences of current Latitude Festival goers. We have been doing interviews here at the Festival over the last 3 days – is the next story yours?